Thursday, August 20, 1914: I was the first one up this morning. Addressing some cards for the folks at home, and managed to while away the time until the other girls were ready to go down to breakfast. We spend the fore-noon in the Orphans Home. One had her arm around my neck nearly all the time. It commenced to rain while we were there but not very hard. Our friend entertained us at Statler’s Restaurant. It is a very fine affair. We left that afternoon for Watkins. I soon began to weary of riding on the train. One gets so tired. We reached the place after dark and to my dismay learned that we were still a mile and a half from the town. We had to take the bus and did not reach our boarding place till after nine, tired and hungry. We didn’t get our supper so we went straight to bed, as we intended getting up early the next morning in order to see the glen. I slept like a rock that night. Daylight was streaming through the windows when I woke. Even the most awesome vacations have days that are tiring. This was the fourth day of the whirlwind trip that Grandma, her sister Ruth, and two other young women took—Niagara Falls, Toronto, Buffalo, and now Watkins Glen in the Finger Lake Region of New York. Whew, I’m feeling tired just listing the names of all the places they visited.
. . . There we took the train and went on to Buffalo. We arrived there about six, got our supper and started out for the home of a friend. It was dark when we reached our destination. This friend is a governess in an Orphan’s Asylum. Sounds like Helena is almost ready to come home to her own bed. Can’t wait to hear about Watkins Glen. My grandparents took my brother, cousin and I there when we were children. It was a very special trip. Oh, and that beautiful old Statler building is gone now. What a lot of wonderful experiences Helena had on this trip! It’s too bad that the building is gone. So many cities have lost buildings that were treasures over the years. I’ve been to the state park, but never to the Nascar track. Someday I want to get back there and do both. Well, at least nowadays she would have been able to eat any time of day or night!!! Good for the stomach but not so good for the waistline!!! I got home yesterday from a trip of my own. I helped my daughter and 5 children drive from IA back to the DC area. It took two days on the road. I stayed two days before flying home. Traveling can be tiring. That’s long drive–but I bet your daughter appreciated your help with the driving. Yes, I know she did. I love the photo of the restaurant. It reminds me of the old tearoom in the Yonkers store in Des Moines, Iowa. When I was young, that was a very special occasion — to dress up, and go to the tearoom for lunch. 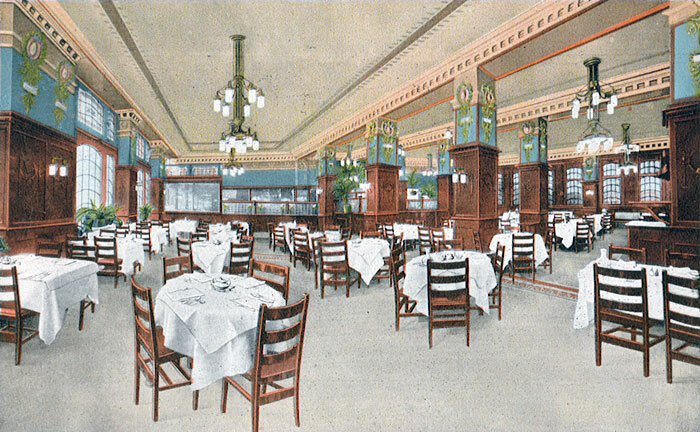 Years ago there were some wonderful restaurants in department stores. What an exciting trip for 4 women to take together – I bet they never forgot it! Special trips like this one are memory makers. This trip and her account continue to be exciting — a pleasure to read. I can’t help wondering about the child clinging to her. I wish I knew the child’s age — and what she was like as an adult. Can’t help it – the psychologist Mona went immediately to thoughts of attachment disorder. Or was it just a lovely positive attraction to grandma.? Sometimes a cigar is just a cigar. I’m not a psychologist, but I also felt concerned about the child. The way the child clung to someone who was basically a stranger does not seem typical. Lovely, Grandma. Just lovely. And the photo she took the other day was just great. Too bad there weren’t any tourists to take the shot with Grandma in it too. I hope she loves Watkins Glen, after the difficult time getting there. It’s almost as spectacular as Niagara Falls — in a quiet way. Upstate New York has some beautiful waterfalls and gorges. I try to be flexible when traveling–but even so it is sometimes challenging. Adventures can be tiring. It’s good that she fell asleep quickly and was able to rest til the sun shined the next day. She slept much better than I typically do when in a new place. The logistics seem so complicated for this trip–yet everything seems to work out. I wonder how a couple farm kids managed to figure all of the details out. Can’t believe all that travel and no dinner? I’m surprised that she was able to go to sleep when she probably had a growling stomach. I know! I’m wondering if not eating wasn’t unusual for her. Maybe they ate sparingly or not as much as we do now. Our portions are HUGE. Her trip sounds lovely. It always amazes how things fall together. I also was pleasantly surprised how well everything fell together for her for this trip. Did she do a lot of traveling? For most of her adult life she lived on a dairy farm and I don’t think that she traveled very much. When she was older she went on a couple trips. In particular I remember that she visited Florida one time. That would be something fun to write about if you can remember the details. Do you know if she liked Florida? Being on a farm does make it impossible to do much traveling. Your gram was in my area! Upstate New York is a beautiful area.